By Tim Neilson: It’s been awhile since I’ve last wrote, but with the David Haye signing on for a fight with Wladimir Klitschko, I thought there was no better time than this time say my thing about this. First of all, I’m shocked that Haye actually got through the entire negotiations process without sabotaging it in some way. I half suspected that Haye would do something to foul the thing up in one way or another just to avoid the prospect of getting beaten from one side of the ring to another by Wladimir, but the money was probably too good for him to resist. My thoughts about this fight are that firstly Haye doesn’t stand a chance because of his lack of size, experience and chin. I could be wrong, but I don’t think I am. Haye has conveniently avoided taking on any other heavyweights in the division that would be a threat to him, taking on Monte Barrett instead. Haye was obviously playing it as safe as possible to avoid getting knocked out and losing this fight, which will make millions for both fighters. Haye comes into the fight having dominated the cruiserweight division for a number of years, but then growing disinterested with his lack of competition to him and wanting for bigger challenges that only the heavyweight division. Haye moved up and immediately set his sights on Wladimir Klitschko, who Haye says he’s been following closely for a number of years. Indeed, Haye supposedly knows Wladimir’s fighting style so well that he can predict what Wladimir is going to do before he does it. That may very well be true, because Wladimir is awfully predictable, especially now. He jabs, jabs some more and then when things look to be going good, Wladimir starts putting his right hand behind the jab. Wladimir doesn’t throw his powerful left hook nearly as much as he used to in the early part of his career. One reason for this is that South African Corrie Sanders was able to land a straight left hand when Wladimir was trying to throw left hooks, and ended up knocking Wladimir out in the 2d round in 2003. Since then, Wladimir has started throwing his left hook only sparingly. Wladimir, 6’7”, will have to give away his height and reach in a big way in order to get his with the 6’2” Haye’s punches. 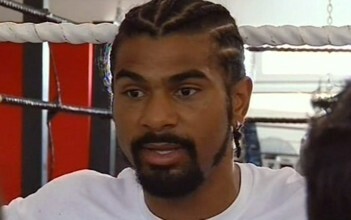 Haye stays on the outside and likes to lunge in with one big shot at a time. If he can hurt his opponent with a big punch, only then does he follow up with a flurry like he did in stopping Enzo Maccarinelli in the 2nd round in March 2008. Even if Haye is able to cross the distance to reach Wladimir’s chin, I doubt it will have the desired effect and Haye will have to slink back to the outside where he will eat a lot of jabs from Wladimir. The jabs will have the effect of breaking down Haye’s face, opening up old scar tissue around his eyes and causing him to bleed. Haye struggled in getting hit a lot by cruiserweight Giacobbe Fragomeni and took a lot of punishment and was covered in blood by the time Haye was eventually able to end matters with a 9th round stoppage. Wladimir is several leagues above Fragomeni, Macarrinelli and Jean Marc Mormeck, easily the best names on Haye’s limited resume. For that reason, I see Haye having problems with Wladimir and ultimately getting knocked out by the 7th.